Between the living and the dead. I have never seen a ghost. And this pisses me off, as I have an awful lot of questions for them, such as “is there a God?” or “what is the afterlife like?” or “what the hell is wrong with poltergeists?” Is there not a single, adequately contrary dead person who just out of spite wants to return and provide incontrovertible proof about the existence of spirits? Consequently, I intend to spend my own afterlife on the talk show circuit. If nothing else, I can then amuse myself in eternity by making fun of psychic mediums and the Ghost Hunters, plus I would get to meet Oprah and Bill Maher, something I am unlikely to accomplish as a mere mortal. Sure, you can argue that once you die, you move to some sort of higher plane of existence where the mundane concerns of us corporeal monkeys are irrelevant, but in the era of reality TV, there has to be some attention whore that wants to be famous, even if they’re only famous for being dead. People abase themselves for much less when they are alive. These musings, and the steady ingestion of intoxicants that for me constitutes a research method, got me thinking. Actually, it got me muttering angrily to myself about the incompetence of supernatural creatures that spend a good portion of their time avoiding human contact, but are obviously not especially good at it, since we keep seeing them throughout history. Then again, I haven’t heard any reports of ninja ghosts, so maybe it’s just an issue of the dead being no better than the living at keeping it on the down low. Now obviously I have as much of a fascination with phantoms as the next guy. Probably more. A couple of dead friends owe me money. And I still get sucked into the television shows about professional ghost chasers, with their earnest desire to be taken seriously, claims of scientific investigation, camera techniques borrowed from the Blair Witch Project, empathy for the paranormally downtrodden, and passion for local history. If nothing else, I give them credit for a unique career choice, but frankly there seems to be more danger and mystery involved in plumbing than there is in ghost hunting. This is not what is making me so surly. What bothers me is the eclecticism of modern ghost investigation techniques. Eclecticism can’t be bad, you say? You probably think open source results in better software, too. Turn on the television and click over to your favorite supernatural reality show. Oh, you know you have one. Personally, I’ve become rather fond of the relatively new Ghost Bait, which usually culminates in putting a burlap sack over somebody’s head and scaring the bejeezus out of them in order to resolve issues with a resident ghost. More typically, a bunch of enthusiastic investigators descend on somebody’s house or place of business, and consult with locals who’ve experienced something weird. A reasonable place to start. Just the facts ma’am. Then, they wait for dark, turn all the lights off, and haul out the equipment and specialists. Heck, they’ve got electronic stuff and infrared and other cool technical gizmos. And then comes the motley crew of specialists. Often an audio engineer (for electronic voice phenomena), a psychic, a skeptic, an exorcist, a pretty young alt-girl, a hip tattooed dude – now I am indeed overgeneralizing, but pretty much any ghost hunting event includes some combination of these folks in a cirque de phantasm of listening for knocks, chatting up vaguely responsive and whispery specters, begging them to leave the poor homeowners alone, and jumping at shadows, which of course abound, since you just turned most of the lights off. I really do get that these shows are about entertainment, and gosh darn it, despite myself I am indeed entertained, but I’ve come to the conclusion that modern ghost hunting is closer to shamanism or modern-mythmaking than it is to actual investigation. In a nutshell, phantasmology has fallen to the trap of model agnosticism in its conduct of inquiry. Model agnosticism in layman’s terms entails the methodology of “throw stuff up against the wall and see what sticks”, or for the more nerdily inclined, reflects what is known as the “Copenhagen Interpretation”, the notion in quantam physics that our study of a thing doesn’t necessarily yield insight into an objective reality, rather the act of measurement causes the set of probabilities to immediately and randomly assume only one of the possible values. We go hunting for ghosts of dead people, and our ghosts behave like a dead person might if they still had something to say. Approach ghosts as if they are some sort of recording, and presto they will probably ignore you as they float on by. I personally like to imagine that every ghost is trying to tell me the day’s winning lottery numbers. Clearly this method has not yet paid off, but fingers crossed. Model agnosticism has a certain cultural cachet in the alternative set these days, mostly since it suggests a level of open-mindedness, a complex reality, an inability to be contained (“you can’t hold me down, man”), and a willingness to unequivocally accept others as human beings, despite their faults and foibles, creed or culture. Accepting that different people have different world views, belief systems, standards of conduct, and otherwise incomprehensible perspectives makes the world a happier place. Nobody obsessed with strange phenomena, weird history, mythology, or folklore is unfamiliar with what life is like at the fringes of scholarship. Unfortunately, when it comes to asking ontological questions about what exists, model agnosticism can far too easily descend into chaos, a bizarre realm of anti-epistemology where everything is true and nothing is forbidden. This is a quality I want in dates and parties, not in the conduct of inquiry. There’s an old trope in anthropology that “sometime what we attribute to culture is just someone being stupid.” This is not a judgment, simply an observation that there are stupid people in every culture doing stupid things for stupid reasons, and that not every inexplicable behavior in the universe can be legitimately chalked up to cultural difference. That said, the world is a strange place, and just because we haven’t managed to wrap our brains around what is happening to us, doesn’t mean an experience is complete fantasy or disturbed delusion. Obviously, I’m not discounting the possibility that ghosts exist. The Halloween costume and linen industries would take a huge hit if this were the case. I am suggesting that they are unlikely to exist simultaneously in the myriad of ontologies we assign them to. Is a ghost a dead person? Is a ghost strong emotion embedded in the ether? Is a ghost like a vinyl record, some sort of playback recorded in the environment? Or is a ghost bleed through from other times or dimensions? I’m not advocating a particular ghost paradigm, simply pointing out that the categories mentioned are mutually exclusive, yet, both mainstream media and serious anomalists behave at most times as if they could all simultaneously be true. That would make the universe a very messed up place. Our species has been living alongside ghosts for millennia and (1) we’re still not sure they exist; (2) if they do exist, we really have no idea what they are (and explanations invariably are heavily weighted with cultural baggage); and (3) given the increased (but always fleeting) popularity of strange phenomena based largely on a resurgence of fantasy fiction, the public (nosy bastards that they are) and Hollywood (greedy bastards that they are) look to self-appointed “ghost experts” to provide compelling back story, that is, to offer up explanations for what ghosts actually are, or at least nice soundbytes. 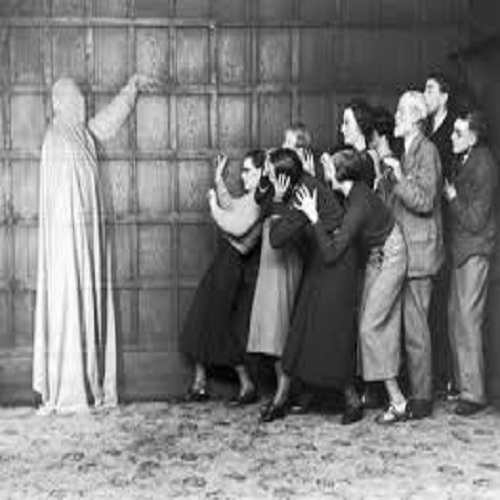 And obligingly, what the Fortean community seems to be able to provide is a cacophony of conflicting propositions about the nature of ghosts, a grab bag of disciplines that hook theories into the phenomena, and a Rube Goldberg assortment of instruments that seem dubiously calibrated and vaguely detect that something is different in the environment. When I turn on the humidifier, something is different in the environment. It doesn’t mean humidity is related to ghosts. And don’t get me started on the psychics (who may also be serious folks, but are operating on such a diverse set of explanations for their abilities that it is sometimes hard to take any of them seriously). There are sober researchers (and in some sense, most ghost hunters are actually serious people) out there that wrestle with these questions. They certainly exist. They certainly are putting in their time investigating the countless reports of contacts with spectral society. They also need to make a living, and we should not begrudge them this, but a discipline without at least a set of coherent competing theoretical models to test competitively is no discipline at all. It’s magic. Just as an anthropologist who hasn’t studied the evolution of anthropological theory routinely stumbles into the same traps of previous generations of anthropologists, so too does the phantasmologist run the risk of becoming interpretive, rather than investigative, should they be ignorant of the thousands of years of thought about ghosts, lack self-awareness of nested cultural beliefs, or manifest a willingness to except any evidence of ghosts that can be tailored into a reasonable and compelling story. I have nothing against telling stories. It’s a noble profession. Some of those stories even have a grain of truth to them and can do useful things like teach us how to be better people. We certainly are at root, cognitively metaphorical creatures, and the act of weaving together information around us into mythology is a creative process that helps us make sense out of the world, but it is still a metaphorical act, and the thing is not the story (or the map is not the territory, if you want to get all insufferably post-modern). That’s why it is amusing when popular anomalists bemoan the fact that they aren’t taken seriously. When you’re operating on the theories that ghosts are dead ancestors, murder victims, angels, demons, electromagnetic phenomena, orbs of light, and trapped souls, and using indicators selected from a variety of categories to support your approach to studying a given manifestation, you may be earnest, but you aren’t being honest. Much like the anthropologist goes out into the field to learn about a culture as a child would, from the daily use of a language, to appropriate behaviors, and on into more complex social rituals, so to should the aspiring phantasmologist understand the language, behaviors, and rituals of the people he intends to study, who unfortunately for him are a bit elusive and don’t respond very well to ethnographic interviewing, being incorporeal (or at least that’s one of the many theories) and all. Makes the job a little harder. What we do have is the several thousand years of reports of ghosts, countless brilliant minds positing theories about ghosts, and science. Not the nasty science that sneers at anything that doesn’t fit an otherwise useful paradigm and produce something that can be sold to Monsanto or the Defense Department, rather the notion that inquiry can be conducted rigorously, methodically, and in the interest of testing theoretical models, without also relying on someone intent on being a positivist douchebag. Ghosts are ubiquitous cross-culturally and across time. It takes an enormous amount of straight up hubris to say that this is not significant. The assumptions we need to proceed are remarkably few. Not everyone who has seen (heard, smelled, felt) a ghost is crazy. Not everyone who has seen a ghost is hallucinating. Not everyone who has seen a ghost is lying. Not everyone who has seen a ghost is mistaken. Or some convenient combination of all four. In all ages and all nations the claim has been made that there were empirical proofs of the existence of such ghosts. In our time these proofs have accumulated so immensely that Prof. Crookes said of them that no other fact of science has been demonstrated so amply as the so-called spiritistic facts. Considering that some of the ghosts who manifested their existence, are several thousand years old, their claim that they are immortal sounds true. But it puts us before the philosophical problem of the possibility and existence of persistent beings and conditions (Danmar, 1924, p5). Given the simple assumption that ghosts exist, either noumenally or phenomenally (I don’t care which, I like ghosts), the question of what they are remains? I’m not trying to come to a conclusion. I’m just trying to frame the question, so the discourse is not guided solely by folks who need media market share or equate weird news with the latest antics of Snooki or the World’s Largest Cheesecake. This does not suggest that I don’t take the topic seriously (as far as I take anything seriously), rather reflects my conviction that if you can’t make a joke about something, you have closed off the part of your intellect that plays with ideas, manipulates them, chews on them, sees how they taste, and sometimes spits them out. And occasionally swallows. Danmar, William. Ghostology … The Naturalistic Philosophy of the Ghosts. New York City: W. Danmar, 1924. You know what they say, “A strange mind is a terrible thing to waste” (or is it, “a wasted mind is terribly strange…”) 🙂 Cheers! IMAO – you are too quick!! !